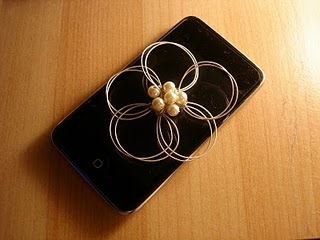 I was flipping through a magazine and found a flower made from wires. I think I did a pretty cute job of making something similar. So what can this be used for? Lots of guys suggested a brooch (I didn't know guys in their twenties thought brooches were fashionable) while the girls liked it to be a hair accessory. I didn't want it to be put on a clip where the clip could show, but one good suggestion was to put it on a chopstick. In the end I just used some black bobby pins (since my hair is black) and attached it to my head as a decorative element; and off to a friend's wedding I went.